There are so many things to see and do when you visit Savannah, one of the South’s most historic cities. Located on the southern tip of the Georgia coast, there is something for everyone to see in Savannah. Many people love to come to Savannah for a weekend getaway. 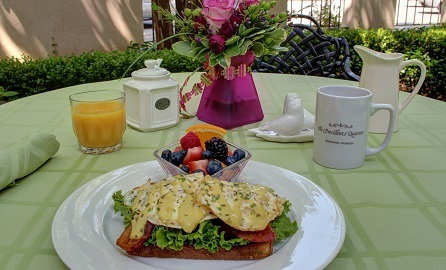 Plan to stay in our lovely bed and breakfast, The President’s Quarters Inn, which is conveniently located in the heart of the downtown historic district at 225 E. President Street. Here you will find 16 richly appointed suites with decorative fireplaces and unparalleled amenities. Our attractive B&B getaway is also pet friendly, and its convenient downtown location allows you to walk through majestic oak-draped parks to numerous Savannah sights where boutique shops, restaurants, galleries and plain old Lowcountry beauty abound. 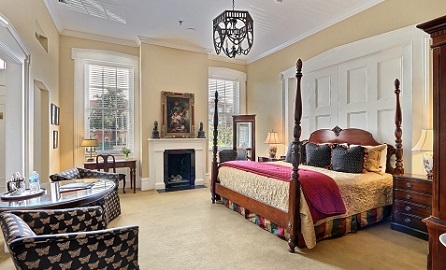 Let The President’s Quarters Inn help you plan your visit to Savannah. Download our online vacation guide to assist you in planning your stay, so that you can take advantage of all that Savannah has to offer. 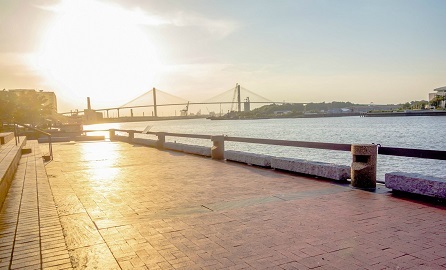 Savannah boasts numerous tours, so plan ahead which ones you would like to see before visiting. 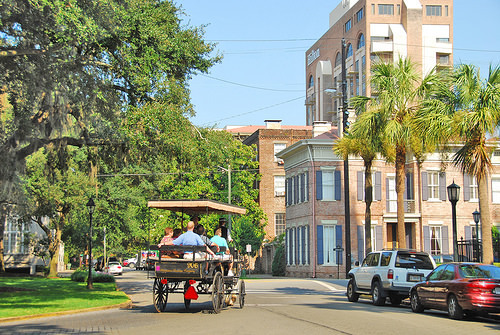 No visit to Savannah would be complete without a sightseeing tour by one of the horse drawn carriages. We love Carriage Tours of Savannah. Their 50 minute narrated tours conveniently depart from the gazebo in the center of The City Market, at Jefferson and West St. Julian Street. 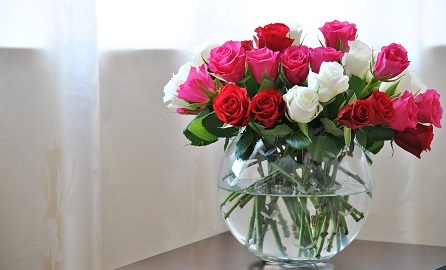 Or, make arrangements to have Carriage Tours pick you up in front of our hotel. The carriage ride is a highlight for so many of our guests and we highly recommend these tours to couples, families and individuals alike for a relaxing way to see and learn about Savannah’s history, all while taking in the beautiful downtown historic district. The City Market itself offers a wealth of things to do in its open-air market. Originally a historic market place used by farmers and traders to sell their goods, you will now find shopping, dining and much more in this four-block area of restored warehouses. For a different kind of open-air tour, try a trolley tour. Old Savannah Tours has been rated the best tour company of 2012 by Savannah Magazine, with Old Town Trolley following as the runner-up. At Old Savannah Tours, choose an Overview Tour that lasts 90 minutes, or an On/Off Tour, that allows you to tour at your own pace by conveniently hopping on and off the trolley throughout the day at 15 different trolley stops in the downtown area. Both companies offer ghost tours and a Paula Deen tour. 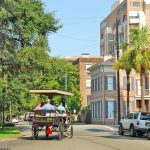 If a trolley-ride isn’t for you, some folks might like to see beautiful historic Savannah on a segway. No previous experience with a segway is necessary and many people find they like the intimacy of this kind of tour. 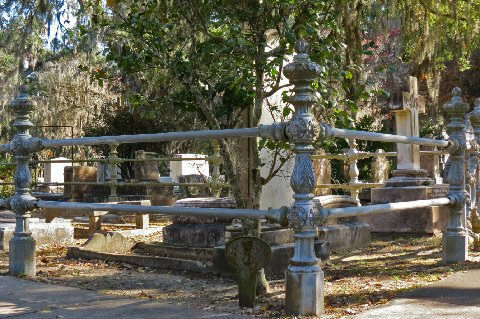 Their new Bonaventure Cemetery Tour will take you through, according to CNN Travel, one of the world’s 10 most beautiful cemeteries. Look them up at Segway of Savannah. 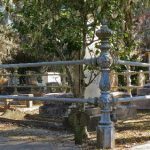 Speaking of cemeteries, Savannah is considered by some to be one of the most haunted cities in America and there are several companies that offer ghost tours in the downtown historic district, such as the Old Town Trolley’s Ghost and Gravestone Tour or Hearse Ghost Tours, where tours are given in a, you guessed it, authentic hearse. Some may like to try a Midnight Walking Tour that goes from 10 p.m. to midnight Friday through Sundays only. There are also several historic home tours you might like to see. Historians and art aficionados will like to visit The Owens-Thomas House, a historic house museum that is considered by architectural historians to be one of the finest examples of English Regency architecture in America. And, The Annual Savannah Tour of Homes and Gardens offers visitors the chance to tour private homes and gardens in a variety of different Savannah neighborhoods. This annual tradition, held each year in March, is one of Savannah’s most popular annual events and we urge interested visitors to make a reservation with us at The President’s Quarters Inn and purchase tickets early. And be sure not to miss touring Savannah’s oldest tabby ruins at Wormsloe. This colonial estate dating back to the early 1700’s allows visitors to interact with costumed interpreters and view a museums with artifacts unearthed at Wormsloe, as well as view a short film about the site and the founding of Georgia. The breathtaking avenue of live oaks and Spanish moss that leads to this historic site owned by the State of Georgia will leave you awed by the beauty and grandeur of Savannah and yearning to soon return to a city filled with history, beauty and heaps of southern charm.